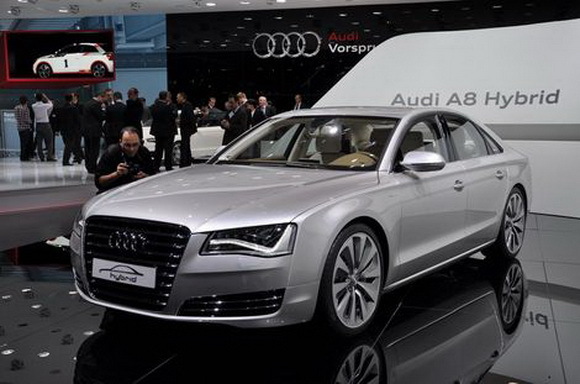 Auto maker, Audi has confirmed that it will produce a new environment friendly A8 limousine. The new model is slated to go into production in 2012. It will be powered by a 2.0-litre four-cylinder petrol engine along with an electric motor. It has a overall fuel economy of 44mpg and a CO2 emissions are below under 148g/km. The combined power of the petrol engine and the electric motor is 242bhp that can take the car from zero to 62mph in just 7.7 seconds and has a top speed of 146mph. The company claims that the car can speed up to 62mph on the electric motor alone. The car features wide gear spread with fast shifting and light aluminium construction for better efficiency. The car will be able to go 1.86 miles at a time on electric power at a steady speed of 37mph. The lithium-ion battery is located in a crash-proof area of the boot for safety and the car weighs 36.7kg and provides 1.3kWh of nominal energy and up to 40kW of power. The A8 hybrid also has a hybrid badge, a choice of 18-inch or 19-inch spoke alloy wheels and exclusive Arctic Silver paint finish.